Fiji’s undergrowth is home to a colourful and often surprisingly humorous bunch of creatures and wildlife. 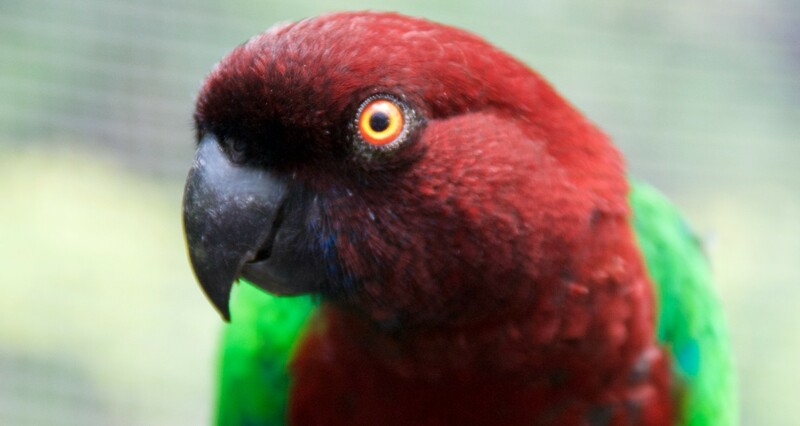 The same looking parrot from neighbouring island Kadavu, isn’t as confident but looks very similar. The Kadavu parrot is the most distinctive of Fiji’s colourful Shining Parrots. It is a large parrot, similar in size to Fiji’s other two endemic Shining Parrots, measuring up to 45 cm from the tip of its beak to the tip of its tail. The colouration of the Kadavu parrot distinguishes it from the other two species. Its head, neck and underparts are a bright scarlet with a blue collar that extends across back of the neck; the back and the rump are a bright shining green. The flight feathers and tail are green, strongly suffused with blue. The bill and feet are black, and the irises are orange in colour. Males and females are similar, however, the bill of males is larger and the head is more square-shaped than females. To witness these birds up close in the wild, we recommend visiting the Kula Eco Wildlife Park located on the Coral Coast of Fiji’s main island Vitu Levu – great for children and families! (I visited it myself last weekend, it was brilliant!) It’s a hands-on wildlife experience which gives you the chance to learn about some of the plants and animals residing in this string of South Pacific islands. The critically endangered, Fijian Crested iguana which still lives wild on some Northern islands such as Taveuni is one of the species you can get up close to see along with mongoose, flying fox bats, parrots, other species of iguanas, many species of bird, turtles and snakes. The Kila Eco Adventure Park with ziplines, swings and rope walks is also a great day out and can be included in any of our Wildcrafted escapes. Please ask for more details. We can Wildcraft any eco island adventure to fit your taste.